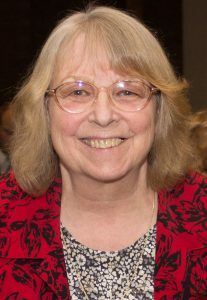 Cherie Valentine will be retiring in August after many years of service to Illinois State University. The campus community is invited to a retirement reception with the Department of Politics and Government from 3-5 p.m. Wednesday, May 9, in the Founders Suite of the Bone Student Center. Remarks will be at 3:30 p.m. Joining Illinois State in 1995, Valentine served in administrative assistant roles for the Career Center, the Department of History, the History and Social Sciences Education Center, and for the Illinois Council for the Social Studies. She began her role as office manager for the Department of Politics and Government in 2005, and will retire from that position August 1. Valentine was familiar with Bloomington-Normal long before she became part of the Redbird family. She started performing on the trapeze at 3 years of age with her parents, George and Lorraine Valentine of The Flying Valentinos. Performing and assisting in the circus for two decades, Valentine worked for the Clyde Beatty Circus, the Big Apple Circus in New York City, the Great American Circus, and the Circus Flora in St. Louis. She wove her knowledge of the circus into academia with articles published in Bandwagon, a journal of the Circus Historical Society. For those who need special accommodations to attend, contact Mary Taylor at metayl2@ilstu.edu.